A Lone Memorial in the Pines: Emilio Carranza ~ The History Girl! Deep in the Pinelands of Wharton State Forest in Tabernacle, New Jersey is a small clearing with a lone twelve foot monument in memory of an aviation hero. Built in 1931, this monument marks the area where famed Mexican aviator Captain Emilio Carranza Rodríguez met his fate during a thunderstorm on July 12, 1928. But his mission was not forgotten and every year since 1928, he has been remembered by local residents in a ceremony at the crash site. 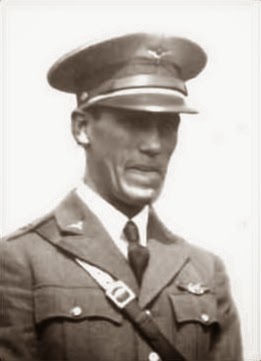 Captain Emilio Carranza Rodríguez was born on December 9, 1905 in Ramos Arízpe, Coahulia, Mexico. He was one of six children to Sebastián Carranza Cepeda (1882-1973) and María Dolores Rodríguez Gómez (1877-1975). He was the great-nephew of President Venustiano Carranza of Mexico and the nephew of famed Mexican aviator Alberto Salinas Carranza. He showed an interest in planes at an early age. When he was only eleven or twelve years old, he would visit the School of Military Aviation of Mexico. His uncle, Major Alberto Salinas Carranza, was the school's first director. He became a student at the School of Military Aviation of Mexico in 1923. He earned the title of "Pilot of Aviation" on January 14, 1926 after completing his flight test on a Mexican built Avro biplane. Just two years, later, between May 24 and 25, 1928, at the age of twenty-two, he set the record for the third longest non-stop solo flight by flying 1,875 miles from San Diego, California to Mexico City in eighteen and one-half hours. In 1927, Charles Lindbergh flew from New York City to Mexico City. In the summer of 1928, Carranza was selected by the Mexican government to undertake a goodwill flight from Mexico City to New York City in response to the previous year's flight. Carranza took off from Mexico City on June 11, 1928 in his plane, The Excelsior, and landed in Washington, D.C. on June 12, 1928. He attempted to fly non-stop from Mexico City to Washington, D.C. but was forced down by fog in North Carolina. In Washington, he was congratulated by President Calvin Coolidge. Continuing on to New York, Carranza landed at Roosevelt Field on Long Island and was honored in New York City by Secretary of Commerce Herbert Hoover and New York City mayor Jimmy Walker. Due to hazardous weather, Carranza postponed his return trip to Mexico for three days and was urged to remain by Charles Lindbergh and others. However, there is a story that has been told that on July 12, Carranza received a telegram from Mexican War Minister Joaquín Amaro ordering his immediate return to Mexico City "or the quality of your manhood will be in doubt." Unfortunately, the telegram no longer exists and was not documented. According to news reports, Carranza departed on the evening of July 12 from Roosevelt Airfield after receiving an updated weather report via telegram from the U.S. Weather Bureau. He took off during a break in the passing thunderstorms, at 7:05 pm. While flying south over the Pinelands during the scattered thunderstorms, around 8:30 pm, his plane crashed in the woods. A number of theories have been presented over the past eighty years, but it is most probable that he was flying too low and hit the trees. Mel Carranza, Emilio's second cousin, believes that Emilio Carranza held a flashlight out the window of his plane in an attempt to find and use railroad tracks as a guide. No one immediately knew of the plane crash, as the area where Carranza crashed was and still remains remote. At about 3:30 pm the following day, July 13, a young boy picking blueberries found the wing of an aircraft. After the authorities were contacted, the Commander of American Legion Post 11 of Mount Holly mobilized its members, all World War I veterans, to search the underbrush of the pines for the body of the plane's pilot. The subsequent search of the area revealed the remains of the plane and positively identified its pilot, Emilio Carranza. According to news reports, authorities identified his body from the Weather Bureau telegram found in his flight jacket pocket and other personal belongings. However, the news reports do not identify that a telegram from Mexican War Minister Joaquín Amaro, ordering his immediate return to Mexico was ever found. His body was recovered and temporarily held in a garage behind Willis Jefferson Buzby's General Store in Chatsworth until arrangements could be made to move it to Mount Holly. Members of American Legion Post 11 stood honor guard until the U.S. Military and government officials arranged to take possession of the body in order to return it to his mother country. Carranza's remains were then moved to New York City where thousands paid respect to the fallen hero. President Coolidge offered the use of the destroyer "USS Florida" to transport the body to the port of Veracruz, Mexico but the offer was denied by the Mexican government. Rather, his body was transported by train, crossing the border through Laredo, Texas. He was interred at Panteón Civil de Dolores in Mexico City on July 24, 1928. After his death, Captain Emilio Carranza was posthumously promoted to the rank of General and an aviation award was established in his honor - the Emilio Carranza Medal of Merit. Shortly after his death, the children of Mexico saved their pennies to quarry stone from Coahulia to build a monument in Carranza's memory at the site of the crash. Each limestone block in the twelve-foot monument represents a state in Mexico, thirty-one in total. The monument was completed in 1931. The monument depicts a number of symbols important to the Mexican people. The prominent Aztec eagle is a symbol of Mexican identity, pride, leadership, and dignity. The eagle is descending and below it are a set of footprints, which mark Carranza's tragic descent and final "walk" on earth. The arrow on the reverse side symbolizes flight into the air and the perpetual endurance of his dream. Inscribed into the monument in Spanish on one side and English on the other are the words, "The People of Mexico Hope That Your High Ideals Will Be Realized." After the tragedy in 1928, the members of Post 11 made a commitment to remember Carranza and his mission of good will and peace. Ever year since 1928, members of Post 11 have held a memorial service at the site on the Saturday nearest the anniversary of the crash. The event is usually attended by an entourage from the Mexican consulates in New York City and Philadelphia. A piece of his plane, saved from the crash site, is in the care of Post 11 and is brought to the ceremony, along with newspaper clippings and photos. The short, but poignant service each year perpetuates the history of that tragic flight and keeps the memory of Emilio Carranza alive, allowing the next generation to understand his impact on the local area and his significance to the Mexican people. This monument, standing solitary amid a dense forest of pine trees, reminds us that although we leave this world alone, our deeds are not forgotten. Gracias, History Girl, for the thorough summary of Caraanza's brief life, last flight and description of the memorial.